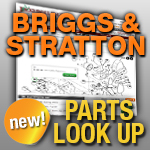 Your Briggs and Stratton Breathers play an important role in the crankcase ventilation system of your small engine. Clogged or worn out breather parts can lead to a blown gasket or seal. Keep your Briggs and Stratton engine healthy with a new breather assembly or breather tube from Jack's. Select your parts below!